Beth Teviotdale has always been a trailblazer. As the University of California's first female agricultural extension specialist and throughout her 30 year career with UC Cooperative Extension (UCCE) her intellectual curiosity, creativity, and problem solving led her to successfully work alongside farmers and industry leaders addressing diseases of deciduous fruit and nut crops and olives. Over the many seasons of her fruitful career she successfully managed the challenges of many plant diseases. Teviotdale has been employing her vast knowledge of plant pathology to train UC Master Gardener volunteers since 2001. She has a gift for tackling difficult issues and helping others to understand and work toward finding solutions in a creative and engaging way. Teviotdale has enjoyed the opportunity to share her gardening interests and curiosity about all things nature with like-minded folks since becoming a UC Master Gardener in Fresno County in 2001. 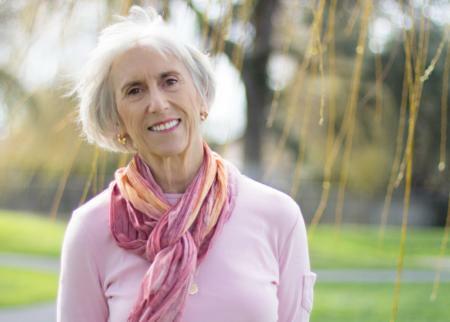 In 2005, her talents and leadership in the UC Master Gardener community were recognized when she became a member of the first statewide steering committee for the program. In her leadership role Teviotdale has provided direction and insight enabling the impressive growth of the statewide UC Master Gardener Program over the past 10 years. Teviotdale has seen firsthand the impacts that UC Master Gardener volunteers make in their communities, from teaching about growing your own food in a backyard garden or least toxic methods for controlling pests to reducing water use in the home landscape, and so much more. UC Master Gardeners are dedicated stewards of the environment and the state of California. To ensure that the UC Master Gardener Program continues to provide valuable outreach and education in California, Teviotdale has made a generous planned gift providing support for the UC Master Gardener Endowment. The important work of the UC Master Gardener Program in all corners of California can continue to grow into the future only with the financial support of donors like Teviotdale. Of the many ways there are to help, making a planned gift is one of the most effective. Please join Beth in supporting the work of the UC Master Gardener Program. If you have questions about the steps involved with making a planned gift, please contact Kelly Scott, Fundraising Coordinator for the UC Master Gardener Program. To view sample bequest language visit Planned Giving for more information.